LiveCareer is an online destination for job seekers, offering resume and cover letter builders and templates, and advanced tools for reviewing, applying for and tracking job openings. Each new LiveCareer user onboards by building his or her resume. Upon completion, research showed what nearly every job seeker wanted to do next: use that resume to apply for jobs. The LiveCareer Dashboard was designed to provide the optimal portal for a job seeker. As a job board, LiveCareer does not enjoy the same brand awareness as Indeed, LinkedIn or Monster. In most cases, the user’s intent is to complete their resume and head for one of the more popular destinations for searching and applying. What those users do not know is that LiveCareer offers the most powerful suite of tools designed for searching, applying, tracking and interview preparation. The challenge was to reverse this mental model through a new dashboard design. LiveCareer offers a plethora of job seeker tools, from cover letter templates to mock interviews and salary calculators. Past iterations of this dashboard had sought to present all of these tools, so as to appeal to a user at any point in his or her job-seeking journey. These iterations were unsuccessful. Our hypothesis was that by attempting to appeal to any point in the journey, the dashboards were not clear enough for users to navigate. There were simply too many options. The new strategy was to focus the dashboard on the first—and most frequented—user state: job searching and applying. The other tools would be surfaced at appropriate moments based on data science and our model of the job seeker journey. The most powerful tool for finding jobs is our data-science-based recommendation engine, which mines a user’s resume, comparing experience to that of millions of others, to determine the most suitable jobs. 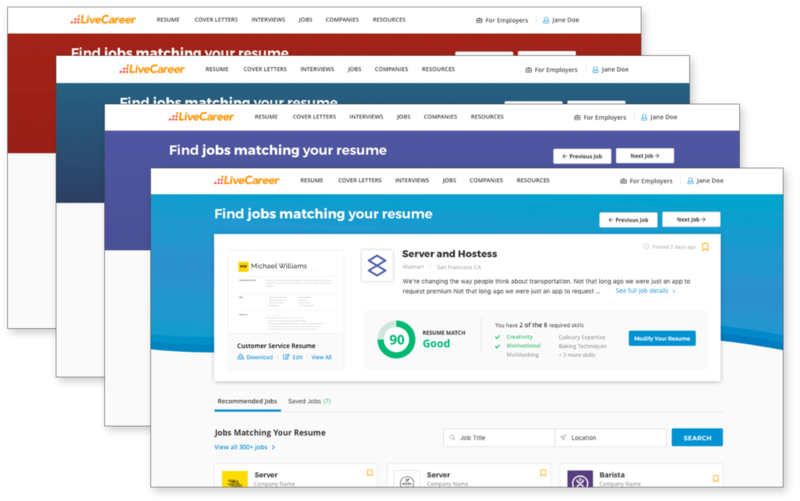 Once a user is ready to apply, LiveCareer’s Resume Customizer enables simple modifications to a user’s resume to better match the requirements for the job. This empowers a user to not only apply to jobs quickly, but with a much higher quality application. Departing from past tactics, we designed the new dashboard modularly to support ever-expanding approaches to user segmentation. By swapping out different versions of the Hero and List Area, we could use the same dashboard to migrate users through their journey. Once the basic page hierarchy had been validated through multiple rounds of user testing, we moved into visual design. We pursued many variations to reflect the correct visceral mood of our users as they seek their next job. The new dashboard—and LiveCareer’s new customer retention strategy—went live in July 2018. As of December 2018, engagement* had increased by 18% and cancelations had decreased by 12%. The new strategy was determined a success and paved the way for finer degrees of user segmentation.